A silent, powerful 1,250-watt generator that charges from either a standard household outlet or two Boulder 30 solar panels (available separately). The safe and quiet operation is ideal for indoor or outdoor use. A simple master switch provides power to multiple AC, DC and USB devices. The LCD readout tracks usage and shows current battery level. Generator charges in 16-20 hours from a wall socket, or 20-24 hours from solar panels. Includes cart for easy transportation. Six-month manufacturers limited warranty. Dimensions: 16L x 11W x 14.5H. Weight: 103 lbs. Cancer and Reproductive Harm- www.P65Warnings.ca.gov. 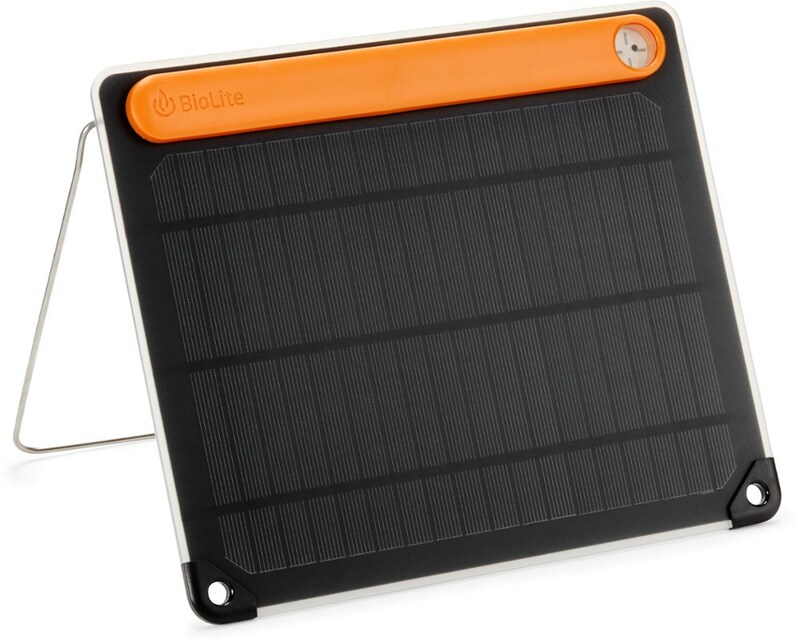 Type: Solar-Power Kits. 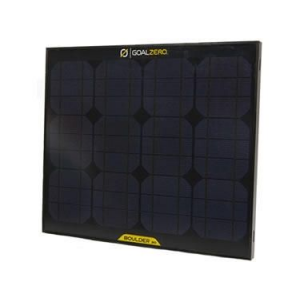 Goal Zero's most powerful generator, the Goal Zero Yeti 1250 Solar Generator provides back-up power for emergency black-outs, car camping trips, and off-grid living. The Yeti 1250 Solar Generator ditches the noise and smelly fumes of gas-powered generators by harnessing power from incoming solar radiation and standard wall outlets. 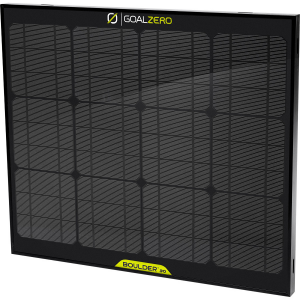 It can be recharged with Goal Zero's compatible solar panels, such as two Boulder 30 Solar Panels (not included) in as little as 40-hours. When plugged into a standard wall outlet, you can expect to fully charge the Yeti 1250 in 18 hours. For the fastest charging, you can use both solar panels and wall outlet charging. Able to power numerous devices, ranging from full-sized refrigerators to camp lights and mobile electronics, the Yeti 1250 features three 2. 1-Amp USB outputs, a 12V output, and three wall-style AC outlets. The 1250-watt power bank charges a laptop over 20 times, as well as a smartphones and digital cameras over 100 times. Providing an accurate readout of power usage, the large screen displays incoming and outgoing power, so you're never unexpectedly left in the dark. For even greater power output, you can daisy chain it to another Yeti 1250, as well as any 12V, 100Ah lead-acid battery (175Ah Max). The connector at the rear of the Yeti 1250 is an Anderson Power SB175. As a bonus for people living out the van life or traveling on the road, you can even charge the Yeti 1250 from a 12V car outlet, although it'll take approximately 44 hours. For charging from a 12V car outlet, you'll need to purchase an 8-millimeter 12V charger. Included with the Yeti 1250 is a power charging cable for plugging into standard wall outlets. 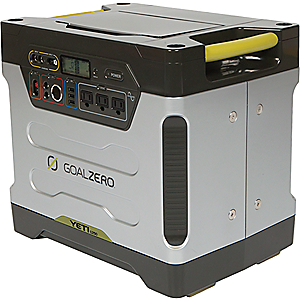 Goal Zero YETI 1250 110V GENERATOR (W/CART) - The YETI 1250 110V GENERATOR (W/CART) by Goal Zero is a plug-and-play, silent, fume-free generator for emergencies, camping, or wherever you need power! A compact and easy to carry design lets you take this power packed generator with where you need it. The 1200 Wh battery capacity allows you to charge almost any electronic device, from phones to refrigerators. 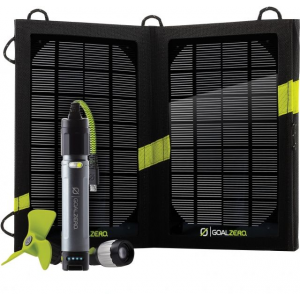 To charge the YETI 1250 you can plug it straight into a wall outlet, use your cars 12V outlet, or connect it to your favorite Goal Zero Solar Panel. 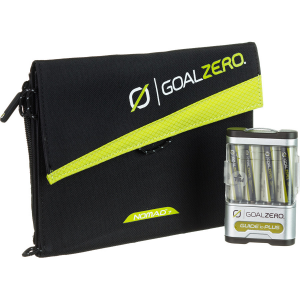 Keep your lights, phones and laptops powered on through any situation with the Goal Zero YETI 1250 110V GENERATOR (W/CART)! 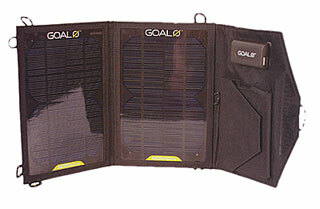 Goal Zero Camp & Hike Yeti 1250 Solar Generator 110V With Roll Cart 31901.